Photo by Joy Frank-Collins About 250 people marched down Front Street during the March For Our Lives on Saturday. Photo by Joy Frank-Collins Emily Robinson, right, a senior at Parkersburg South High School, and her mom, Julia Robinson, of Parkersburg, make signs to carry in the March for our Lives in Muskingum Park in Marietta on Saturday. Photo by Joy Frank-Collins Dani Thrasher, 15, of Fort Frye High School, addresses the crowd during the March For Our Lives rally in Marietta. As a trans individual, Thrasher said she is already at risk for increased violence. Photo by Joy Frank-Collins Andrew Kingry, 16, waves to cars driving down Front Street during the March for our Lives rally in Marietta. 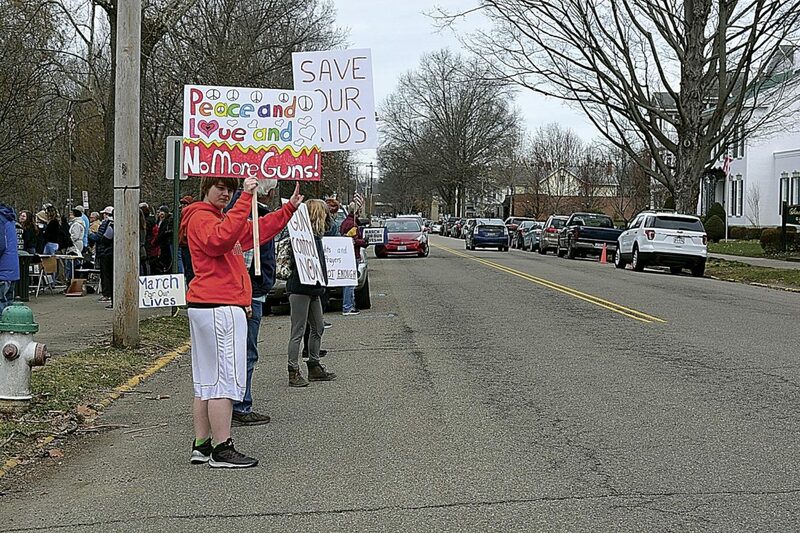 Photo by Joy Frank-Collins Fiona Apshaga-Meaux, 13, stands beside neighbor Laura Rush, 36, holding their signs. MARIETTA — They came carrying signs — some elaborately drawn, others hastily scribbled in the backs of their cars. They came wearing t-shirts — some ordered from the official online store, others bearing the logos of their various high schools. They came in groups — some with friends and classmates, others their parents and grandparents. They came to say enough is enough — for the children that will come after them and for the ones who died from gun violence before them. The March For Our Lives, a student-led activist movement dedicated to ending gun violence and the epidemic of mass shootings in the nation’s schools, took place nationwide on Saturday. CBS News estimated 200,000 people attended a rally and marched on the capitol in Washington, D.C., and untold numbers rallied and marched at some 800 sibling events across the globe, including about 250 residents of the Mid-Ohio Valley in Muskingum Park in Marietta. “I’m here today because young people are dying and I don’t want to be next,” said Marietta High School junior Azelyn Kerenik as Bob Dylan’s “The Times They Are a-Changing” rang out throughout the riverfront park on the chilly spring morning. Started by the students of Marjory Stoneman Douglas High School in Parkland, Fla., after a mass shooting by a former student just over one month ago murdered 17 people and wounded 17 in what has become one of the deadliest school massacres in the United States, the goal of the March For Our Lives is for young people and families to take to the streets “to demand that their lives and safety become a priority,” according to the group’s official website. 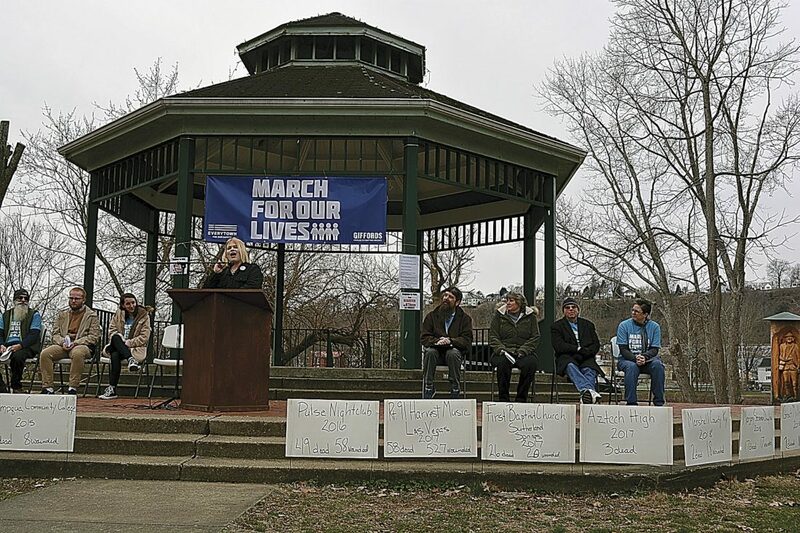 The local event included speeches by local teens, teachers, representatives from Washington County Children Services, clergy and organizers, a march down Front Street and a closing prayer for peace. Planned in part by local resident Lisa Bammerlin, her driving force behind getting involved are her 11- and 14-year-old children. “Right now, this is the most important thing we can be doing,” she said. 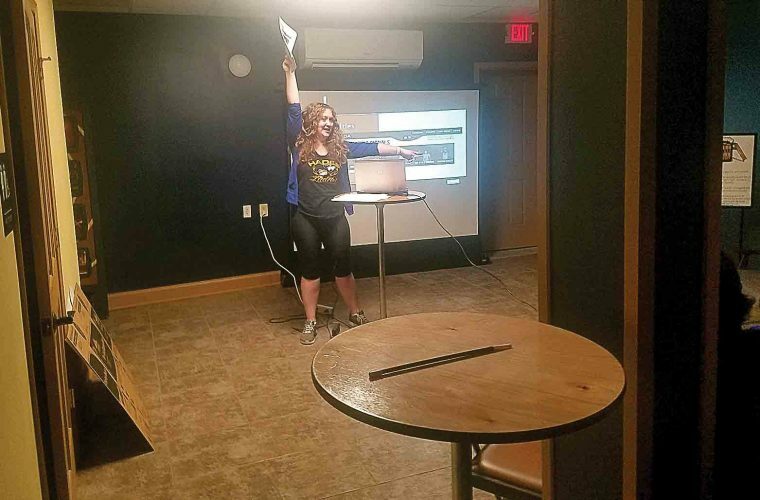 Originally, she planned to attend a rally and march in Columbus, but changed her mind when she learned others were interested in hosting an event in Marietta. MHS senior Henry Burton, 18, heard a group was forming and looking for student leaders from English teacher Amy Warren and attended their first meeting. He plans to attend Otterbein University in the fall and study history, obtain his teaching license and teach on the high school level. His concern isn’t just about his own well-being. Burton’s mother, Cindy Burton, is a teacher at Phillips Elementary School in Marietta. Henry Burton said he fears for her every time he hears about schools being on lockdown. Burton recognizes that the issues surrounding the March For Our Lives related to gun control are complex. He isn’t opposed to gun ownership, but believes that weapons like AR-15s and accessories like bump stocks should be taken out of circulation, he said. “I believe in responsible gun ownership, but it stops at what a person needs for hunting and protection. You don’t need those things for that,” he said. Laura Rush, 36, of Marietta, attended the March For Our Lives to demand change for her son, who is almost 4 years old. “I don’t want him to have to worry about where he’s going to hide in school when people start shooting,” she said through tears. The Blacksburg, Va., native knows far too well how devastating school shootings are. Her parents were both working at Virginia Tech on April 16, 2007, when a gunman murdered 32 people and wounded 17 with semi-automatic weapons. She graduated from the university in 2003, but had many friends who lost loved ones in the attack. Dani Thrasher, 15, believes that she’s already at a greater risk of being a victim of violence as a transgender individual. “I just don’t want to have to worry about being shot while I’m trying to get an education,” she said. The Fort Frye High School sophomore spoke at the rally about her fears of gun violence and hopes for the future and fought back against negative stereotypes about her generation. “I’m told that since my generation is a bunch of Tide Pod eaters, I’m not mature enough to speak out. You know what? Screw that!” she said during her speech. 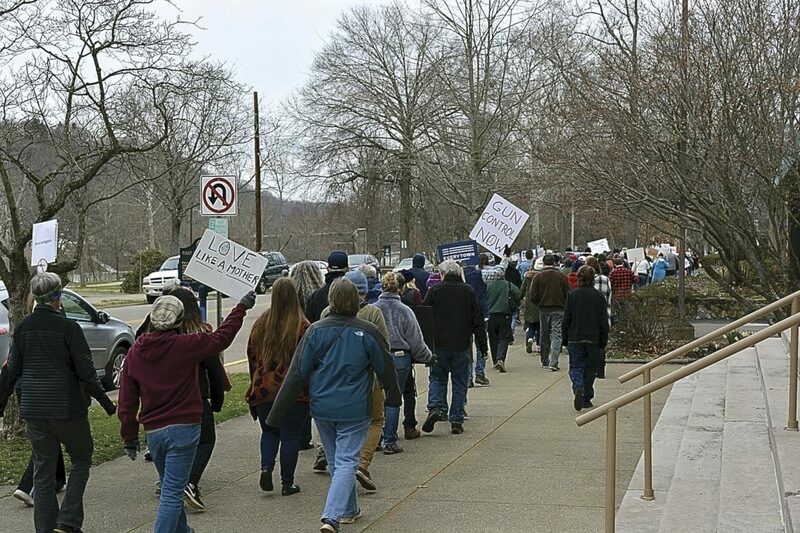 Following the rally, attendees took to the streets of Marietta, marching from Muskingum Park, down Front Street and back for a closing prayer by the Rev. Kathryn Hawbaker of the First Unitarian Universalist Society of Marietta. The March For Our Lives isn’t the end of the efforts to speak out against gun violence in schools, said Bammerlin. 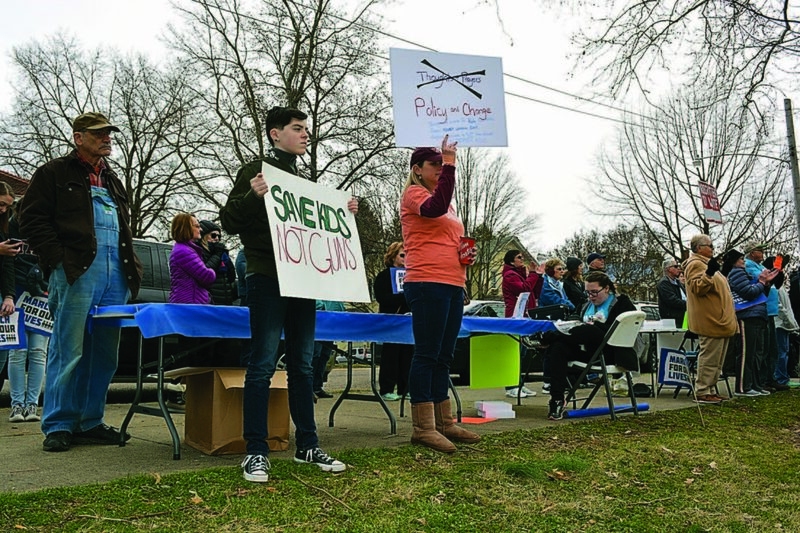 In addition to registering attendees to vote, organizers also circulated a petition they plan to present to Marietta City School Superintendent Will Hampton opposing a possible controversial proposal of arming teachers in classrooms. In addition, they are planning to start a Moms Demand Action chapter in the area. The group was formed on a national level to pressure legislators, companies and educational institutions to establish common sense gun laws to prevent gun violence. 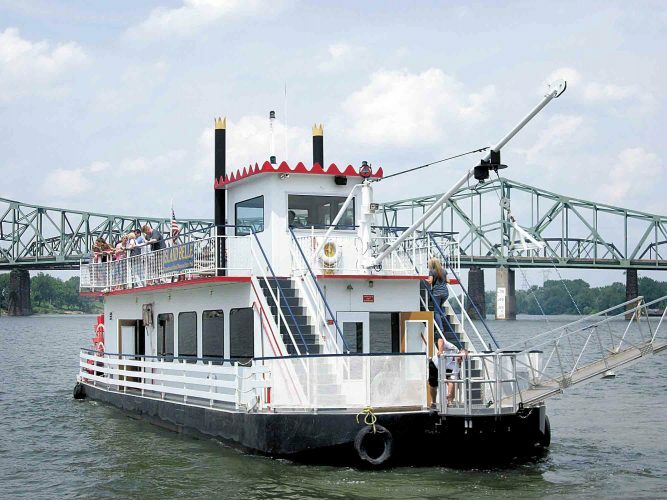 “It can’t stop here, we have to move this forward,” Bammerlin said.